The battle is won but celebrations are awaited – that sums up the mood of tribals who unanimously rejected the plan to mine bauxite on Odisha‘s Niyamgiri hills during the course of 12 gram sabhas held here recently. Celebrations, of course, will happen when Congress scion, Rahul Gandhi, who anointed himself as the “sepoy of Niyamgiri tribals in Delhi” at a public meeting here in 2008, visits the area again shortly. “A delegation of 50 people from four blocks went to Delhi last month and briefed Rahul Gandhi about the outcome of the gram sabhas. He has promised us to visit Niyamgiri soon to celebrate our victory,” said Kumuti Majhi, president of Niyamgiri Surakhya Samiti, agitating against the mining project. It is one and half months since the gram sabhas ended. And, the villagers who participated in the referendum are still as resilient against the project as they were on the eve of the gram sabhas. Interestingly, though the Supreme Court had ordered the holding of gram sabhas to decide, if the tribals’ right to worship Niyamraja at Hundaljali, a hilltop in the Niyamgiri range, be affected by taking up mining activity 10 km away at Niyam Dangar, the tribals consider the entire 250 sq km spread of the Niyamgiri hill range straddling the two districts of Kalahandi and Rayagada as sacred to their religious belief. “We are not aware of any Hundaljali. 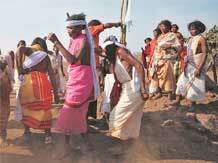 Our Niyamraja sits on Niyam Dangar where mining will be done,” said Ratu Sikaka of Phuldumer village. But more than the concern over sacrilege of their religious belief, 8,000 Dongaria Kondhs and other tribes living on the slopes of the hill range are worried over the loss of livelihood if mining is taken up there. Apart from being home to many varieties of fruit-bearing trees, the hill slopes provide thousands of acres of free agriculture land on which the tribals have claimed their ownership according to the Forest Rights Act. In the absence of any structured land holding, tribals are ploughing on as much land as they can, to farm paddy, pulses, vegetables and spices. “I produce enough to meet the needs of my 18-member family throughout the year and sell the surplus grain, vegetables and spices in the local market to earn Rs 2,000 every week,” says Labanya Gouda of Ijurupa village, who is cultivating on 70 acres on the hill slope. Supported by such a self-sustaining economy and various assistance received from different government welfare schemes, tribals with limited materialist needs and unexposed to industrialisation, do not see any benefit fromVedanta‘s alumina plant or the mining project. Rather, they consider these activities a threat to their status quo. “The mining will dry up the perennial streams coming down from the hills and irrigating our land throughout the year,” Gouda said. The Vedanta Aluminium (VAL) authorities, however, discard these fears, citing the studies done by Central Mine Planning and Design Institute, a Coal India unit and Wildlife Institute of India. “There will be no impact on the streams according to the reports of these institutions,” said a VAL official. Meanwhile, scepticism of local villagers over getting jobs in the project has further fuelled opposition against it. “Though I had lost 27 decimal land for Vedanta’s alumina refinery, I have not got a job. With the company not offering any direct job, I had approached the contractors for a job, but was disappointed when they asked for bribes,” says Sada Nayak of Kendubaradi village. But such allegations are refuted by VAL. “Of 3,000 people working in our plant (600 permanent employees and the rest contractual jobs), nearly 80 per cent are locals,” pointed out an officer of the company. But locals, as defined by the official includes the entire state, not just the villages in the vicinity of the project.